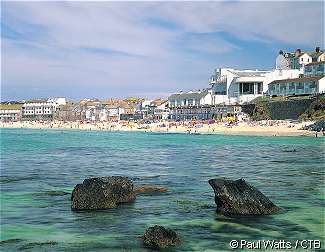 St Ives is one of the UKs most popular Holiday destinations. Located on The Gulf Stream, this area has a milder climate than the rest of Britain. The town has four beautiful beaches, each with its own unique character. St Ives is perfect for a relaxing family holiday on the beach, but equally suited to an energetic surfing break,. The town centres around a picturesque tidal harbour. The harbour is the hub of activity in the town with the quayside lined with restaurants and cafes. From St Ives harbour, narrow streets radiate out towards "The Didgey" and "Downalong", St Ives artists' with the Tate Gallery overlooking the famous Porthmeor beach with its high quality sands and surfers riding on the Atlantic Swell. Bed and Breakfast holidays in St Ives are a popular way to explore this beautiful area. Many of our listed B&B Guesthouses in The St Ives area have stunning sea views, bringing an extra quality to a stay in this beautiful region. 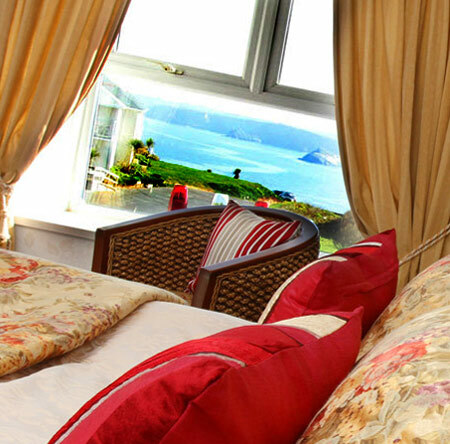 Ensuite Bed & Breakfast + Hotel tel: 01637 872658. Newquay Holidays and Short Breaks with coast and sea views from the property and holiday prices from £96. take a relaxing B&B holiday in Newquay - West Cornwall, where you can explore the beautiful coastline, hidden coves and stunning beaches that this region is so well known for, in an area warmed by the Gulf Stream - The Carlton offers couples elegance and tranquillity all tailored for two - seven individual bedrooms some with Sea Views. With our elegant lounge & stylish bar extending onto a candlelit patio, situated minutes away from the harbour, town and Fistral beach & within walking distance to no less than 8 excellent restaurants you have everything you need for enjoying a relaxing & tranquil get away. NB - Please confirm details prior to booking. Ensuite Bed & Breakfast tel: 01736 797643. Carbis Bay Holidays and Short Breaks and holiday prices from £35. Enjoy a short B&B break in Carbis Bay on Cornwalls western tip, famous for the stunning coastline and excellent beaches - A small guest house set in a quiet cul-de-sac offering first class accommodation in a quiet homely atmosphere, Amie is a modern semidetached bungalow tastefully furnished and decorated throughout. Ensuite Bed & Breakfast tel: 01736 798317. Ensuite Bed & Breakfast tel: 01736 753777. St Ives Bay, Hayle, Holidays and Short Breaks with the benefit of sea views and holiday prices from £40. Enjoy a short B&B break in St Ives Bay, Hayle, on Cornwalls western tip, famous for the stunning coastline and excellent beaches - A magnificent bed and breakfast with 5 guest bedrooms in possibility the best position in the St Ives Bay area. 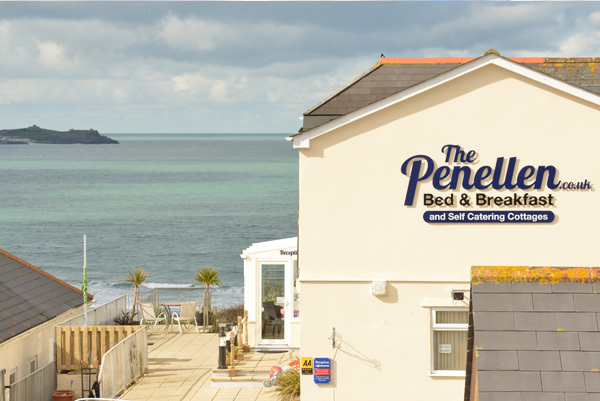 All bedrooms are en-suite and all have excellent sea views overlooking St. Ives Bay towards St Ives. We are just 100 yards from the beach and 10 yards from the coastal path. We were recently awarded the AA 4 Star Silver Award for Guest Accommodation. Ensuite Bed & Breakfast + Self catering + Camping + glamping + shepherd hut tel: 01736 786 425. 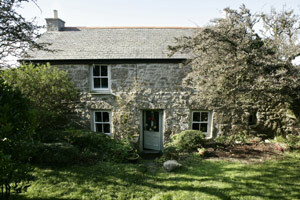 Morvah near St Just Holidays and Short Breaks with sea views and holiday prices from £45. 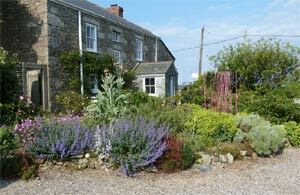 Enjoy a Relaxing Cornish Holiday in Morvah near St Just West Cornwall. This is a beautiful holiday location, with great beaches, stunning coastline and many holidays attractions. 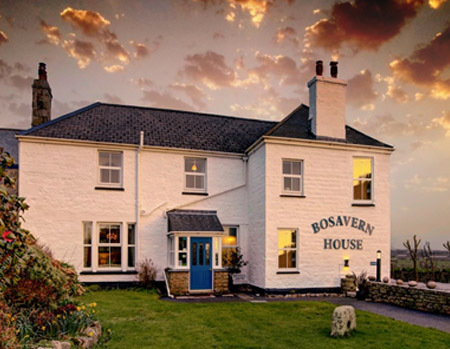 Lands End and St Ives offer holidays that people will always remember - Bed and Breakfast and Self-catering holidays situated near the village of Morvah the Farmhouse is around 300 years old and is warm and comfortable with organic bedlinen, and a cosy parlour. The breakfasts are generous with organic produce from the farmhouse whenever possible. Bedrooms: 2 Double rooms + 1 single. Ensuite Bed & Breakfast tel: 01736 757830. Ensuite Bed & Breakfast tel: 01736 794654. St Ives Holidays and Short Breaks with coast and sea views from the property and holiday prices from £30. take a relaxing B&B holiday in St Ives - West Cornwall, where you can explore the beautiful coastline, hidden coves and stunning beaches that this region is so well known for, in an area warmed by the Gulf Stream - Comfortable bed and breakfast in St Ives. A ground floor level studio apartment ,sleeping 2/3 persons.Hillcrest is ¾ mile from St.Ives - situated in a quiet residential road,close to local facilities and bus stops.An ideal walking or touring centre.We offer continental breakfasts,or a cooked English on request,at an additional cost. Ensuite Bed & Breakfast tel: 01736-788301. 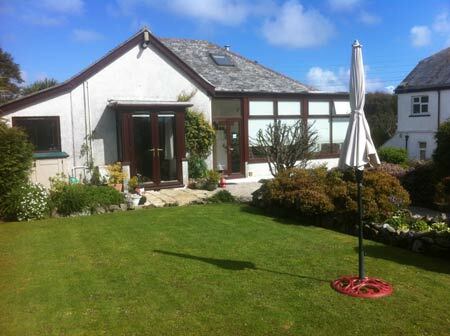 St.Just in Penwith, Lands end Holidays and Short Breaks with the benefit of sea views and holiday prices from £39. Enjoy a short B&B break in St.Just in Penwith, Lands end on Cornwalls western tip, famous for the stunning coastline and excellent beaches - Discover the heart of Poldark country. 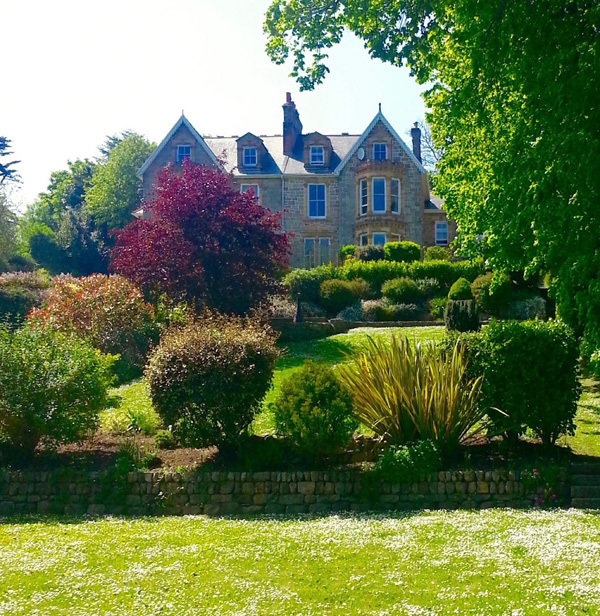 A historic country guesthouse offering delicious cooked breakfasts, friendly service and comfortable accommodation. An ideal walking or touring centre. 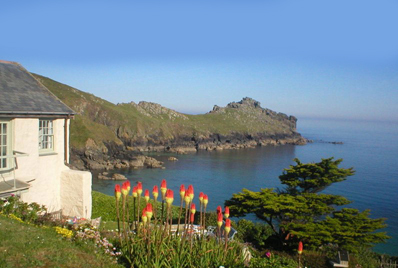 Relax in our gardens, walk the coastal footpath to an isolated sandy cove or explore West Cornwall. The choice is yours! Ensuite Bed & Breakfast tel: 01736 797061. Here you will find the accommodation you need: Guest Houses, Bed and Breakfast (B&B) Accommodation - St Ives, Cornwall UK - Hotels, Inns, B&B, Guest Houses, Bed and Breakfast in St Ives, St Ives Hotels, St Ives Guest Houses, St Ives Bed and Breakfast (B&B) at reasonable prices.